There may be people that have more talent than you, but there’s no excuse for anyone to work harder than you do. -Derek Jeter, five-time baseball World Series champion. The following list might be considered eight of the top traits for winning personalities. Take time to deliberate, but when the time for action comes, stop thinking and go in. -Napoleon. Spare shooting is an area in which it’s difficult to distinguish between mental and physical aspects of the game. Dean Hinitz gives serious bowlers the mental tools for performing at their best. 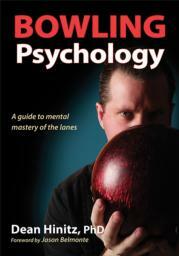 Bowling Psychology features the latest mental training concepts including mindfulness training, sensory awareness, and mind–body connection as well as insightful interviews from top bowlers—many of whom are clients of the author. As the leading authority on bowling’s mental game, Dean Hinitz has worked with the premier players, coaches, and teams in the sport. He has helped countless pros elevate their results, avoid slumps, and overcome stressors affecting performance. He has improved their play, and now he’s ready for you. In Bowling Psychology, you’ll learn the mental strategies for performing your best, day in and day out. From progressive muscle relaxing techniques to positive self-talk and focus cues, you will pick up spares more consistently, improve accuracy, and overcome anxieties. Manage pressure, find your focus, and reach your potential. With detailed information on topics including mindfulness training, sensory awareness, and the mind–body connection, Bowling Psychology is your all-in-one toolbox for mental mastery of the lanes. Primary audience is intermediate to advanced bowlers and bowling instructors and coaches. To a lesser degree, sport psychologists and college activities courses. Dean Hinitz, PhD, has been practicing sport psychology for more than 30 years. He is the sport psychologist for the U.S. bowling team, with facilities at the International Training and Research Center at USBC headquarters in Arlington, Texas, previously training at the United States Olympic Training Center in Colorado Springs. He is the lead mental game consultant in revising the curriculum for the United States Bowling Congress Gold Coaching Program. Hinitz has been the consulting sport psychologist for esteemed bowling programs at Wichita State University, University of Maryland Eastern Shore, Robert Morris University, and Webber International University—all of which have won national championships. He is the consulting psychologist for the Trevino Golf Institute and has consulted to the gymnastics team at the University of Minnesota as well as to the men’s basketball and baseball teams and the women’s volleyball and basketball teams at the University of Maryland Eastern Shore. He is also a consultant to the athletic department at Georgetown University in Washington, DC. Hinitz has worked with numerous champions on the men’s and women’s pro bowling tours as well as with many amateur champions. For more than 10 years, he was a staff writer for Bowling This Month. He is considered by many to be the leading authority worldwide on the mental game of bowling. Hinitz earned his PhD in psychology from the University of Nevada at Reno, where he is an adjunct professor. He is a former governor’s appointee to the Nevada State Board of Psychological Examiners and was previously the chief of psychology at West Hills Hospital in Reno. Hinitz maintains a private practice in Reno.